Marcell Ozuna is coming home, but it remains to be seen whether his return will be a triumphant one to Marlins Park. Ozuna, the left fielder for the St. Louis Cardinals, will lead his team into a three-game series against his former club, the Miami Marlins, starting Monday. The Marlins (46-67), who have the longest active losing streak in the majors at six games, are in last place in the National League. They went 0-6 on their just completed road trip, losing 5-3 to the Philadelphia Phillies on Sunday. "It was a rough road trip," Marlins manager Don Mattingly said. That type of losing baseball is what was widely predicted for the Marlins after they traded several of their biggest stars this past winter, including National League Most Valuable Player Giancarlo Stanton as well as Ozuna, Christian Yelich and Dee Gordon. [post_ads]On the other side, the Cardinals -- who have missed the playoffs two years in a row for the first time since 2008 -- figured to contend this season but have been disappointing overall with a 58-54 record, which puts them third in the NL Central. However, things have been better for the Cardinals, who have won three consecutive series, all against teams above .500. Cardinals first baseman Matt Carpenter hit his career-high 29th homer of the season to help St. Louis beat the Pittsburgh Pirates 2-1 on Sunday. But before this run, there was definitely disappointment overall with the team and particularly in the case of Ozuna. The Cardinals acquired him in exchange for prospects -- including pitchers Sandy Alcantara and Zac Gallen and center fielder Magneuris Sierra - but Ozuna has not lived up to his breakthrough 2017 season. Last year, Ozuna hit .312 with 30 doubles, 37 homers, 124 RBIs and a .924 OPS -- all career highs. This year, Ozuna is batting .265 with 11 doubles, 13 homers, 59 RBIs and a .699 OPS. So who is the real Ozuna? Cardinals fans may not want to hear this, but last year might be the aberration compared to Ozuna's five other big-league seasons. His batting average his first four seasons, for example, were .265, .269, .259 and .266. And those numbers are in line with his current stats. In addition, Ozuna has played with a nagging shoulder injury all season, and teams have run on his once-powerful arm repeatedly. Ozuna, 27, gets daily treatment on the shoulder, and while surgery is not yet being considered, this is an injury the Cardinals were aware of when they swung the deal with Miami. "He is being judicious about the throws he makes," Cardinals interim manager Mike Shildt said of Ozuna, who will be a free agent after this season. "But I actually believe he is making strides. Relative to where he was at the start of the season, he is less limited." Ozuna's issues this year have coincided with problems all around the St. Louis outfield. 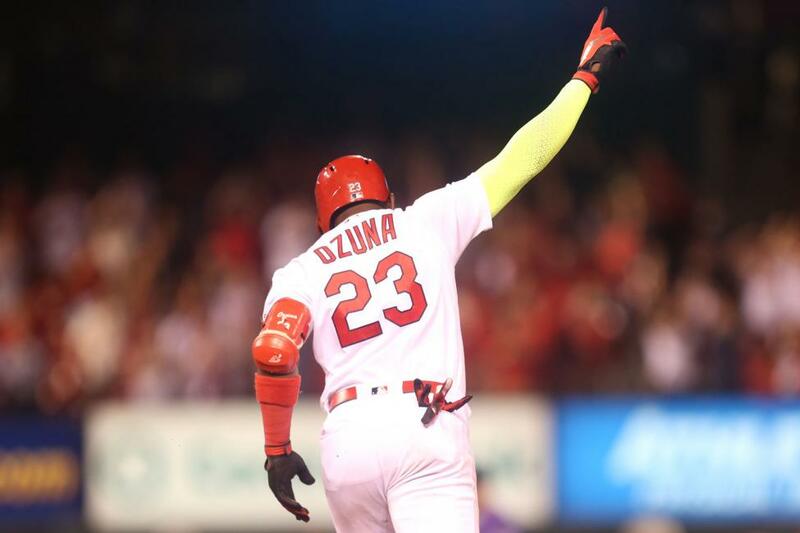 At the start of the season, the Cards projected a left-to-right trio of Ozuna, Tommy Pham, who finished 11th in National League MVP voting last year; and Dexter Fowler, who signed a five-year, $82.5 million deal with the Cardinals following the 2017 season. However, the Cards traded Pham to the Tampa Bay Rays on July 31, and Fowler fractured his left foot on Friday and could be out for the season. Fowler's injury, the Pham trade and the overall disappointing play in the St. Louis outfield help explain why it ranks 17th in the majors in run scored - a truly mediocre performance. On Monday, Ozuna figures to match up against former Marlins teammate Wei-Yin Chen (3-8, 5.86 ERA). St. Louis will counter with right-hander Luke Weaver (6-9, 4.75). Chen, a left-hander, was scheduled to pitch Sunday. But the Marlins moved him back one day so he could avoid pitching in Philadelphia on Sunday and instead face the Cardinals at home on Monday. It's easy to see why that decision was made: Chen has a 2.18 ERA at home this season. On the road, he has a 10.27 ERA. Chen allowed two runs in 4 1/3 innings on June 6 at the Cardinals, getting a no-decision in a game the Marlins won 11-3. For his career, Chen is 0-0 with a 5.23 ERA in two career appearances (both starts) against the Cardinals. Meanwhile, Weaver has failed to finish six innings in nine of his past 12 starts. A former first-round pick (2014) out of Florida State, Weaver's 93 mph fastball is better than average and his changeup is also a plus pitch. Last year, Weaver won seven consecutive starts between August and September, going 7-2 with a 3.88 ERA overall. This season, Weaver has yet to find his form since starting 2-0 in his first three starts of the season.